Developed & Published by Nintendo. Releases May 29, 2015. Available on Wii U. Review copy provided by publisher. Note: The review copy provided by Nintendo ran on a closed press review server network. While the network was stable, this may not be the case on the game's launch. If you are concerned about network performance, it is prudent to wait until launch to see how Nintendo's servers hold up. 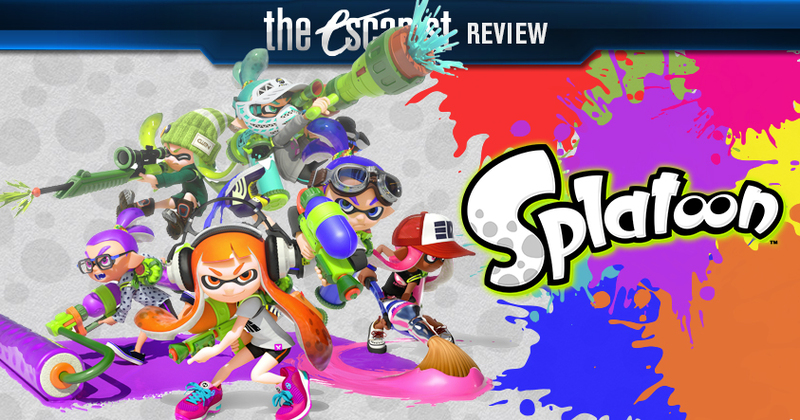 The surprise announce of last year's E3, Splatoon is Nintendo's quirky entry into the modern shooter genre. Combining the kind of ranked progression play you see in Call of Duty with an odd territory control gimmick, it's an unlikely game that pulls of a win despite the odds. 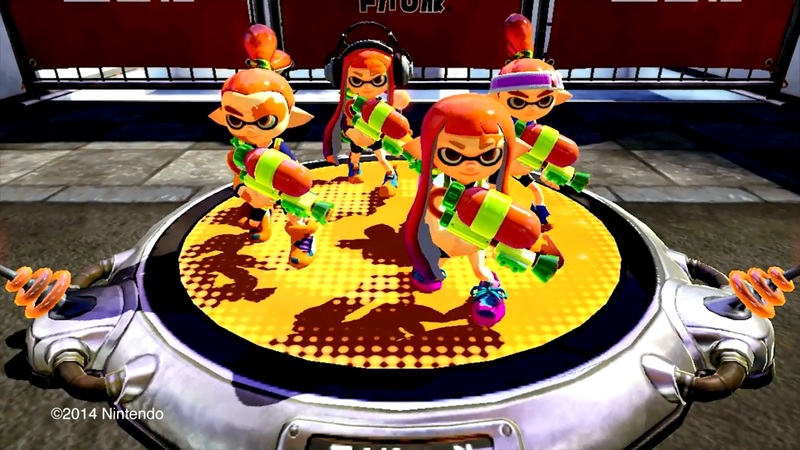 You control an inkling, a person who can turn into a double-fast ink swimming squid and back, spreading ink of your color using spraying tools like guns and rollers. Ink of other colors hurts and slows you down, or causes you to splat into an explosion of ink - only to later respawn. It's a vaguely nonviolent take on the genre friendly to those who don't traditionally like shooters - in fact, it might be one of the only all ages, family-friendly shooters I can think of. The game focuses on fast-paced multiplayer battles, but delivers a single player experience that's not to be scoffed at. Ultimately, it'll be a game that many people enjoy in three minute to one hour bursts, not marathon sessions, and it exceeds all expectations for anyone who wants a shooter experience without shooter baggage. Or a shooter experience on the Wii U, period. 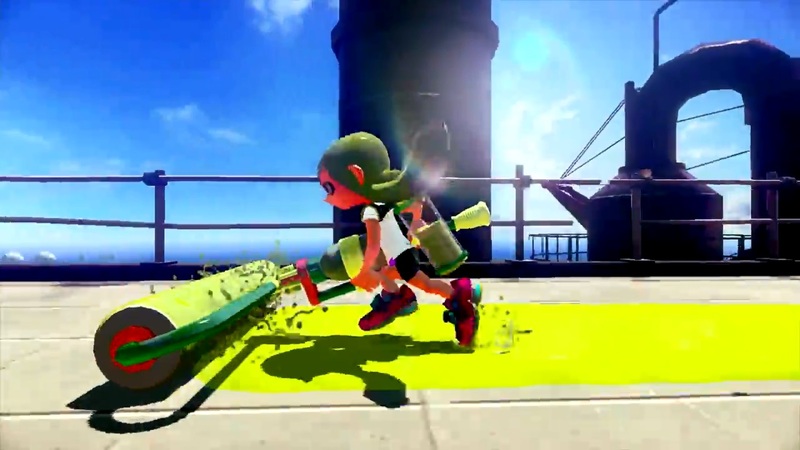 One of the things I was at first skeptical about was Splatoon's visuals. Early previews made the game look bright and cartoonish - undeniably attractive and cute visuals, but hard to follow. That worry is somewhat borne out in the game, as flying paint splats and fast moving characters can change the flow of battle pretty quickly and block your view of your own character. Often, when this happens, you've already been splatted - but that doesn't make it any less frustrating. That said, the visuals of the various inks splashing onto each other and overwriting have a variety of nice effects and for a game primarily about mixing two colors, it doesn't get old fast. Character design is clever, varied, and wonderful taking inspiration from quirky urban fashion, and customizing your character to stand out is pretty fun. Enemies in the single player game have good silhouettes and are pretty easily recognizable for most, but that sadly doesn't hold up in multiplayer. Weapons are small enough compared to characters that you'll often not know what weapon someone's packing until it's too late - the notable exception being the massive splat rollers. That's too bad, since multiplayer is really the name of the game in Splatoon. 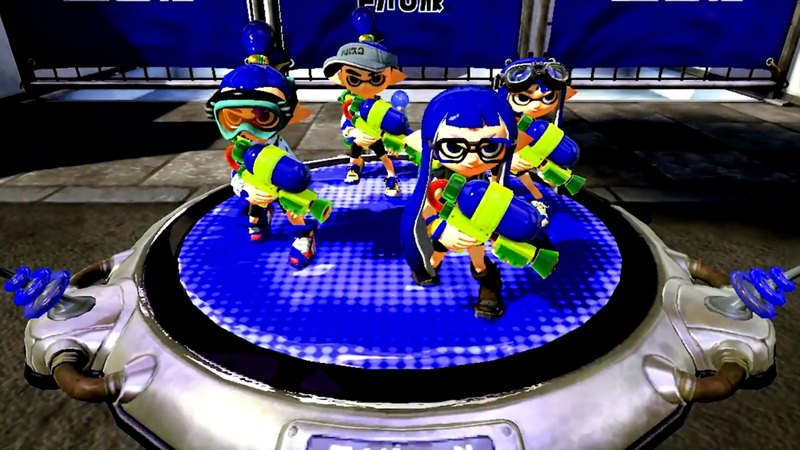 The primary gameplay type is Turf War, where players from two teams of four compete to cover the most of the map's floor within the time limit. At the end of the match, the team with the most coverage wins. 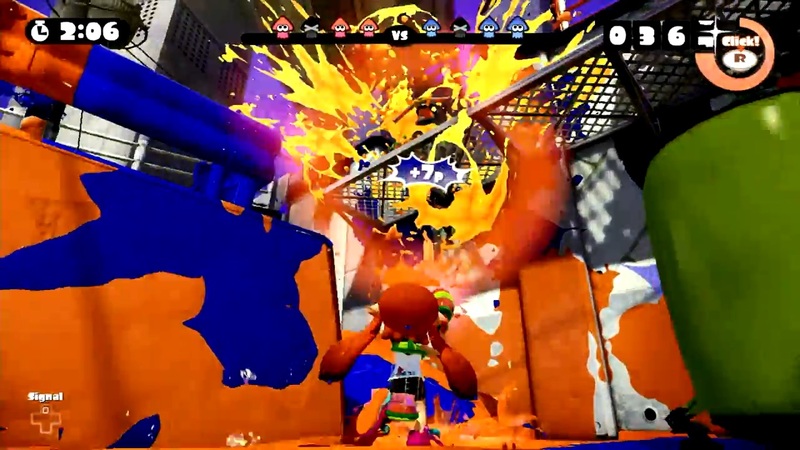 During the game, you use varied paint-spewing weapons to cover the map and splat opponents - because squid people react pretty explosively to paint of opposing colors. That's the basics of it, and over the course of matches you rank up your level and gain currency to unlock more weapons, more gear, and enter ranked battles. Ranked battles use a different ruleset, forcing more conflict by having only a certain part of the map count for victory. 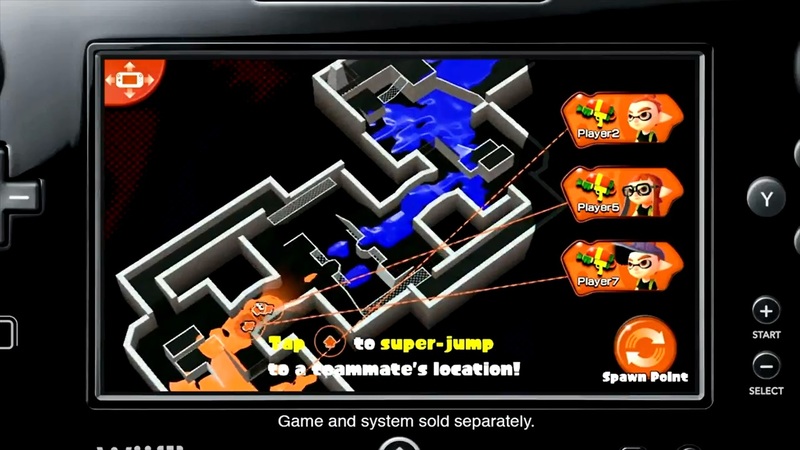 Much of the best multiplayer uses ambush tactics, blind paint-spewing charges, and the verticality that swimming up walls in squid form gives you to reach new areas and vantage points.